From approximately 1050 to 1650, the Monongahela Indians sought out suitable ridges, saddles, and knobs among the Upper Ohio and Monongahela River drainages to establish their villages. Never the site of a Monongahela village, but nevertheless conveniently placed on top of a bluff above Cross Creek, the high ground of Meadowcroft is home to a recreated Monongahela Indian Village of the late pre-historic period. 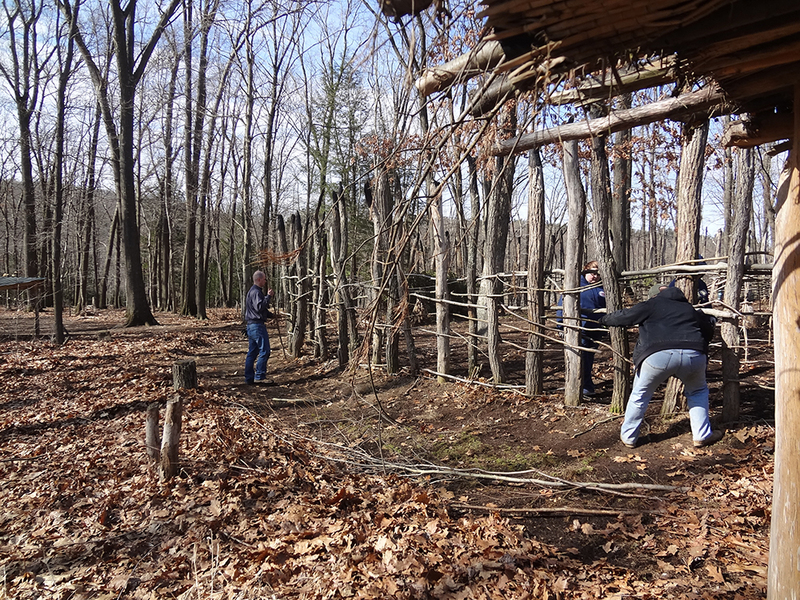 While prehistoric villagers continually maintained their villages out of necessity, each winter the staff of Meadowcroft winterizes our recreated Prehistoric Indian Village. So with the thaw underway, we get to break out of our libraries, archives, and offices to spread our wings under the clear spring sky, to maintain and add features to the space. Typical shingling materials at the time of European contact came in two forms: woven mats made from long-leafed plant varieties such as cattail, rush, and reed, or the bark of elm, poplar, or basswood trees. Making our own authentic mats, or stripping enough bark, would gobble up too many of the on-site natural resources that make up the bulk of our materials. Like many other museums, we use plastic sheeting sandwiched between two layers of commercially made mats. Meadowcroft staff work on the frame of the big house before the matting goes on. Photo by Claire Shrontz. Our task begins with our interpretive staff reporting in for sewing duty. They cut, layer, and sew the matting into various lengths, each sized for a particular spot on the domed structures. 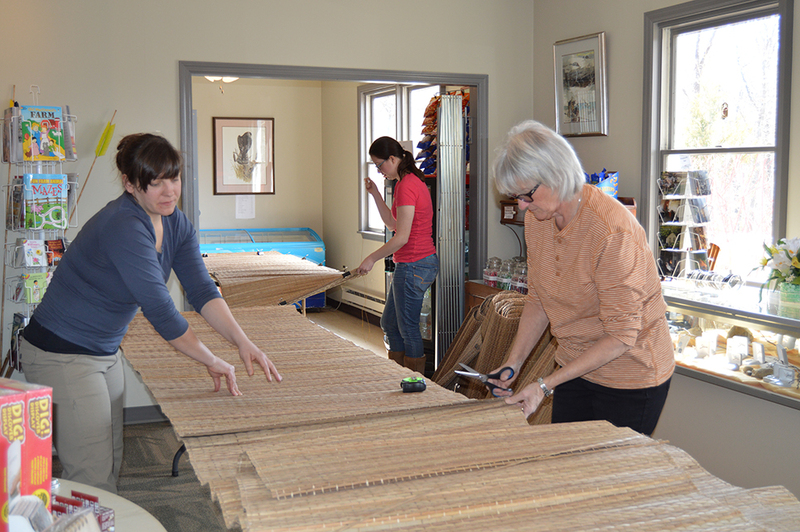 Once the matting is being produced, other staff members report to the wigwam frames to get them prepped for attachment. 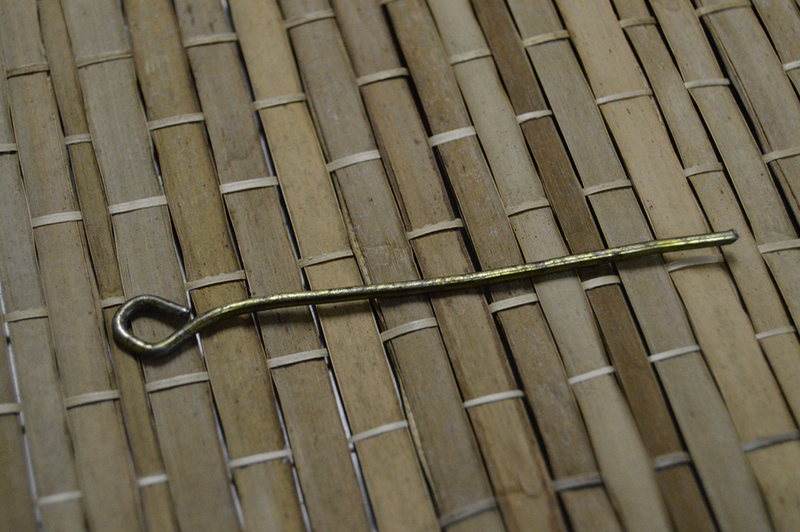 We begin by inspecting all the lashings used at each intersection of the woven tension pole frame. Then we double check all the lashings. Climbing on the frame apprises us of any loose joints (they jiggle and even slide under body weight) as we hop on to add any saplings needed and re-tie. 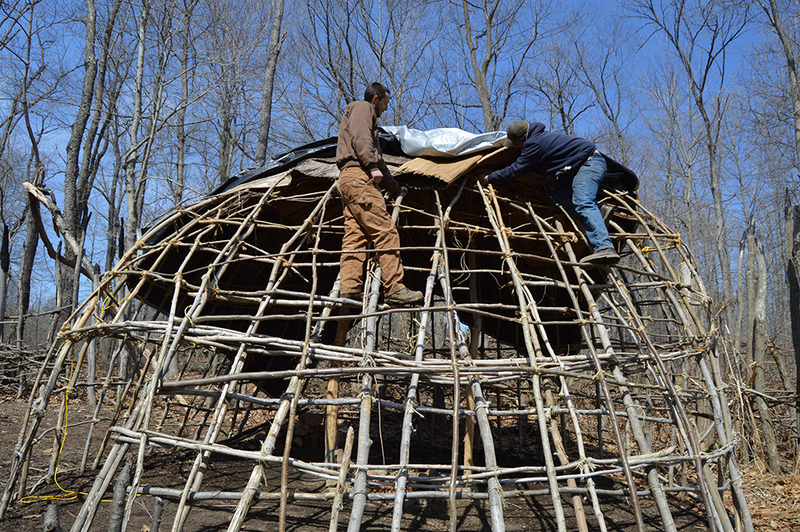 Once satisfied with the framing, the wigwam can receive its roofing. 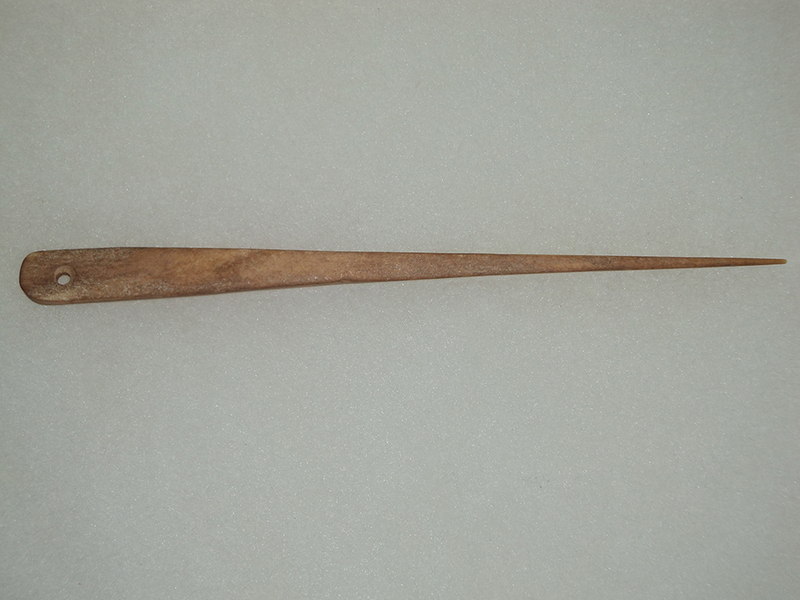 To do this, many proto-historic woodland cultures used bone needles to pass natural lashing materials, like milkweed, dogbane, or elm inner bark, through the shingling for fastening. Rather than brittle bones, we use wire coat-hanger needles to punch through the plastic and carry jute or sisal twine through for tying. The village is getting ready for your visit. Are you getting ready for your visit to the village? Meadowcroft opens for the season on Saturday, May 2. Andrew Donovan is program coordinator at Meadowcroft Rockshelter and Historic Village.